I've vented here many times about my frustrations with diabetes. The outward emotions of anger, denial, and bitterness. However I rarely talk about my inward struggles. Call it emotional wellbeing, mental health, or any of the other terms. Whatever label you give it, one thing is true about many people with diabetes: We hide much of the emotional burden we bear living with a chronic illness most of the time. Most people see me as a cheerful, caring individual, or so I've been told. Confession: There are so many times that I'm smiling on the outside while tearing myself up on the inside. 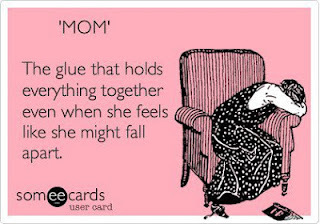 I feel I need to be Super Mom, Super Wife, Super Teacher, Super Friend, and Super Diabetic. When it comes to diabetes, I might ask: Why did I eat that? Why didn't I do that? Why can't I make it to the gym? Why am I not the perfect diabetic? Why am I so hard on myself? Why am I not harder on myself? Yes, I know that I can do better, but I also know that I could do worse. I'd like to do better at my own diabetes management. I'd also like to do more in the world of diabetes blogging and patient advocacy. I actually told my husband today that part of me would like to be a full-time advocate and part-time educator, maybe a tutor. However at this time my calling is to be a full-time educator and part-time advocate. We agreed that some day the roles may become reversed, when it's the right time. "Diabetes Ramblings" - it's more than a blog title. It's how I process my thoughts and feelings. As I ramble, I am able to express myself in a way that helps me through some tough times. My hope is that I am able to also reach out and help others. There is no shame in admitting that you need help. If life seems to be dragging you down and you're not living the life you want to live, reach out. Find someone you trust - a doctor, a friend, clergy, a counselor. There is no shame in saying that you can't do it all. You don't need to be a super hero. You are loved and you are valued!